I'm assuming one of these would work fine in an N64 correct? If so are you selling these or were they a preorder thing? If so what are you charging for one? Micro entrusted me with all the PCB's he didn't need himself, because he didn't have the time to sell them off one by one. Once they arrive to me I could sell you one or two kits (including the needed components). I'm not sure what the total will be yet, but I'll get back about that once I have the sum. Yes, I'd guess so. But I don't have a suitable N64 to test. Actually the PCB's aren't even assembled yet. It's true, half of the PCB's are sold to Heffa. But you can order your own PCB's if you like to. Once you got an order confirmation containing your order number you can mail them the gerber files for manufacturing the PCB's. It's the ZIP file I've attached to this post. I would probably be starting with the PCE first in terms of mods but I'm tooling up to mod those systems right now. Okay so does this introduce display lag versus using transistors? Looks slick! How is the picture quality? Does the AC-Bias input combination of 82pF/3.6M get the picture just right? One or two weeks ago I've installed one of my five THS7314 PCB's in a PCE Interface Unit. The picture looks fine, just as fine as on the pictures I posted some months ago. Maybe I can post some screenshots later. I don't know why it seems like people are using 5.1 MOhm pull-up resistors by default. I've also raised that question on the assemblergames forums but I haven't received an answer yet. 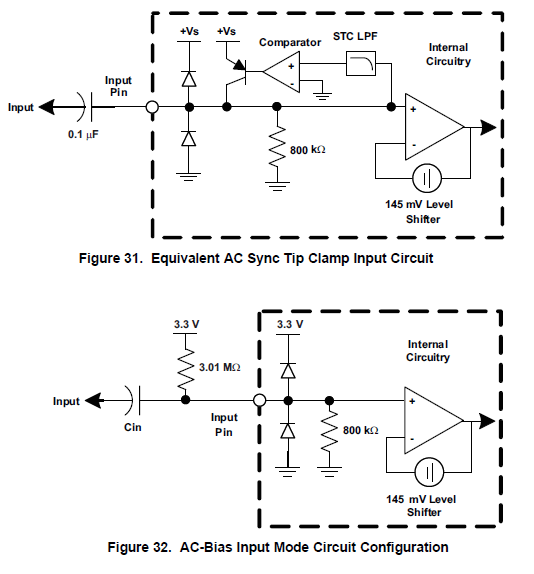 To rephrase my question, what is the picture quality difference between 82nF/3.6M AC-bias input operation and 0.1uF AC-coupled input operation? Does it actually "fix" or correct anything? To be honest I've ruled out the sync tip clamp input mode in the very beginning because to me the AC-bias input seems better suited for the RGB video signals of the PCE. There's no sync signal embedded in those RGB signals, or is it? First of all, it seems there's a typo in the datasheet, see above. Now in the second example they show you how to get the same input DC-bias point when using a 5 V supply: Then you'll need a 5.1 MOhm pull-up resistor. What good is an input DC-bias point of 0.68 V when we're dealing with 0.7 Vpp RGB video signals? The internal 800 kOhm pull-down resistor has a tolerance of 20% so the value could be only 640 kOhm in the worst case. With a 5.1 MOhm pull-up then you'll end up with an input DC-bias point of 0.56 V.
Now I'm not an expert in video/TV signals. But I could imagine if we're dealing with a 0.7 Vpp signal and we got an input DC-bias point of only 0.56 V the opamp's input voltage could dip into the negative values, depending on the waveform. I picked up 3.6M 1% resistors and 82nF caps and will try this with a THS7374. I can make observations on my setup, but don't have a scope to take measurements. I take it that your shot of cotton is similar to your assembled PCBs then. Just trying to get a pq diff. Assuming the video is 0.7 Vpp. One extreme - one small white dot in the middle of an otherwise black line in an otherwise black frame. DC average is pretty much 0 V.
Other extreme - Completely white frame. Each line is only white 80% of the time in reality because of the blanking interval. So DC average of the video is 0.56 V.
If the video alternates from one extreme to the other you require headroom of 0.7V above the bias point and 0.56 V below. That explains the numbers. Worst case tolerance on the internal resistor (everything else being ideal) and it will still be linear. So 5.1M will work but 3.6k is a better choice. The only reason to chose the bias point so close to ground is if you were trying to get away without the output coupling caps (and didn't care about wasted power). Unfortunately the RGB signal the PC Engine is not 0.7 Vpp, it's actually 0.8 Vpp (I know because I bought a PC Engine a few months ago). To compensate for this I suggest attenuating the output slightly. Instead of a 75 ohm resistor in series with the output, you could use 86 ohms in series and 586 ohms to ground. This way it still looks like a 75 ohm output to the outside world. For E24 resistor values try 91 in series and 470 to ground. Not perfect but good enough - 0.67 Vpp is much better than 0.80 Vpp. Without the bias network the video will distort when it clamped to the negative rail (ground in this case). This will happen when the DC average is high and the video goes dark part way through a line. At the point it goes dark it will be clamped at ground while the input cap charges. Is the distortion significant? I don't know... It's best just to bias the amplifier properly and not worry about it. So 5.1M will work but 3.6k is a better choice. Unfortunately the RGB signal the PC Engine is not 0.7 Vpp, it's actually 0.8 Vpp (I know because I bought a PC Engine a few months ago). To compensate for this I suggest attenuating the output slightly. Instead of a 75 ohm resistor in series with the output, you could use 86 ohms in series and 586 ohms to ground. This way it still looks like a 75 ohm output to the outside world. For E24 resistor values try 91 in series and 470 to ground. Not perfect but good enough - 0.67 Vpp is much better than 0.8 Vpp. What do you mean my E24? Would the resistors to ground go before or after the series resistors? Thanks for the response! Yes, 3.6 kOhm was just a typo, definitely 3.6 MOhm. There are different E series. E24 means there are 24 different values per decade. 91 Ohm and 470 Ohm are available in the E24 series, but 586 Ohm isn't. 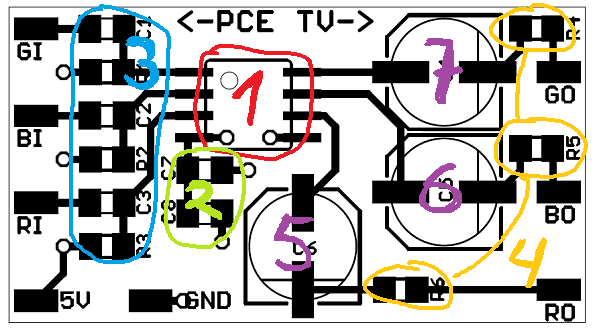 - Would the resistors to ground go before or after the series resistors? @viletim: 0.8 Vpp... quite interesting! On which kind of PCE did you measure the voltage? On a standard white PCE? Yes, the white square one. In comparison, the NES/Famicom video chip outputs a composite video signal of 2.15 Vpp (I measured one NES and two Famicoms, it's very consistent). My guess is the little bit extra is to compensate for the losses in simple transistor driver circuits which were typically used. The emitter follower configuration has a gain of less than one in practice due to the emitter resistance (little re). Ok, sounds good. I will pick up some 470 ohm resistors and try that out. I'm planning to continue using the 7374 for the TG16 for simplicity (want RGBS output). Tim, do you have any comments about how best to use the THS with the CSYNC signal from the expansion port/Hu6260? I'm currently using 0.1uF on input and 220uF + 75 ohm on output. I haven't observed any issues with this configuration. Wow, this thread is still going?! Glad to see you guys doing some good work designing amps. Ive halfway picked up the project again and have spent some time working on a board design the last few days. Its similar to what you guys came up with but also different. Ive noticed that its hard to cover every console with a single amp design since everything seems to be a little different with regard to rgb source signals. Anyways, heres a board design Im working on. Note, pin2 of R1-R3 is going to ground and R1-R3 are 5k pots. I know this is an old thread, but I've got to say. I followed the suggestions made by Viletim with 3.6M ohm Pullups 82 nf caps and 91 ohm resistors in series with 470 ohm to ground. installed on my SuperGrafx and the picture is beautiful. Has there ever been a definitive answer as to what set up would be the best for PC Engine applications? I've had good results with Tim's suggestion as well. However, Tim has since created a product called the AV-DRIVER that works perfectly with the NEC systems! I have one of the preproduction samples and its definitely the best solution yet! It even includes a CSYNC circuit specially tailored for the Hu6260 CSYNC output. He hasn't started selling them yet, as he wants to document all of the specific applications to reduce time and effort supporting it. That said, its been many months since he started documentation so I hope he'll start selling them soon! RGB32E, I've just checked Tim's website, and still no sign of the AV Driver. Do you know if it is still in development? He had them manufactured over a year ago and I'd imagine he's still sitting on stock. I can't say why he doesn't put them up on his shop other than the original reason of wanting to release it with sufficient installation guides. Have you tried emailing him with an order request? Sorry to drag this post up but need a bit of help. I have a bag of SMD resistors labeled as 'Multicomp, MCPWR05FT EW3604' which has '3604' labeled on the resistor itsefl and then another bag labeled as 'RES-SMD 0805-100R' which appear to have '1000' on the resistor itself. 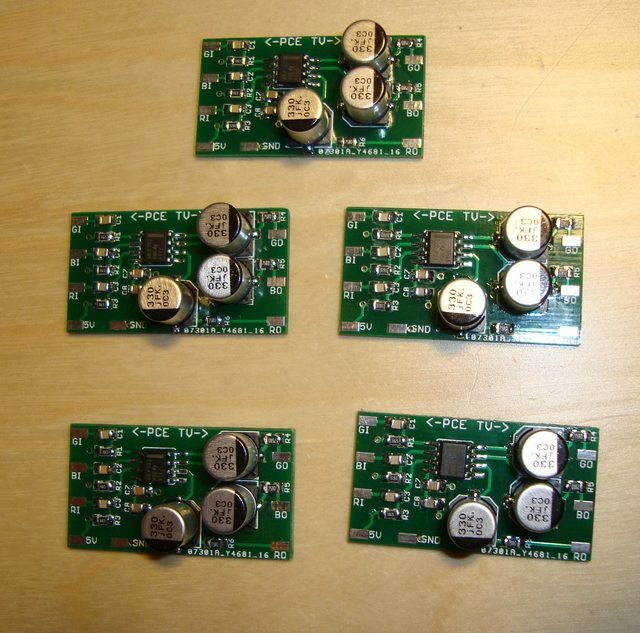 Does anyone know which resistors need to go on which R1-R3 and R4-R6 solder pads on the PCB? ?